Great Britain’s Aileen McGlynn was dethroned as Paralympic B 1km Time Trial champion but secured tandem silver on the second morning at the Velodrome. 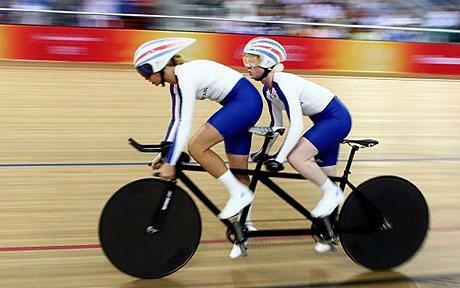 McGlynn, who is visually impaired, and her sighted pilot Helen Scott, recorded their fastest time on a tandem together, covering the four laps in one minute 9.469 seconds but it was not enough to hold off double world champion Felicity Johnson of Australia, piloted by Stephanie Morton. “I’m a little bit disappointed, but at the same time I’m really pleased to win a silver and it’s good to have got a PB as a team together,” said Glaswegian McGlynn, 39. “I’d like to thank the crowd for coming along and supporting us all so much,” she said of another loud, full house of 6,000 at the track. The Aussie duo beat the previous Paralympic record, set in Beijing by McGlynn and former partner Ellen Hunter, who stepped away from the sport in 2009. Scott, a 22 year old from Halesowen, was part of GB’s able-bodied under 23 sprint academy and could feature in a future Olympic team. Britain’s second pair, Liverpool’s Lora Turnham and pilot Fiona Duncan, were fourth in 1:11.479, an improvement on sixth place at the World Championships in February and another personal best. Twenty-three year old Turnham’s target is the longer pursuit event on Sunday, where she expects to win her first Paralympic medal.